Myogenin is a member of the MyoD family of myogenic basic helix-loop-helix (bHLH) transcription factors. MyoD family members are expressed exclusively in skeletal muscle and play a key role in activating myogenesis. Rh-30 cells. Skeletal muscle or rhabdomyosarcoma. Myogenin is a member of the MyoD family of myogenic basic helix-loop-helix (bHLH) transcription factors that also includes MyoD, Myf-5, and MRF4 (also known as herculinor Myf-6). MyoD family members are expressed exclusively in skeletal muscle and play a key role in activating myogenesis by binding to enhancer sequences of muscle-specific genes. The regulatory domain of MyoD is approximately 70 amino acids in length and includes both a basic DNA binding motif and a bHLH dimerization motif. MyoD family members share about 80% amino acid homology in their bHLH motifs. Anti-myogenin labels the nuclei of myoblasts in developing muscle tissue, and is expressed in tumor cell nuclei of rhabdomyosarcoma and some leiomyosarcomas. 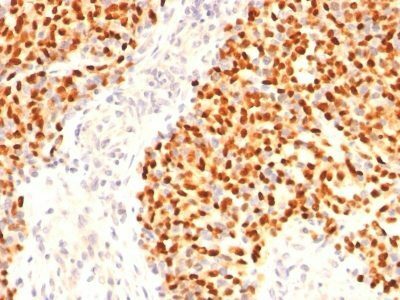 Positive nuclear staining may occur in Wilms tumor. Catalog number key for antibody number 0632, Anti-Myogenin (F5D) The prefix indicates conjugation, followed by the antibody number and size suffix.